Last week, a group of dedicated brick builders from Singapore that operates under the moniker Titans Creations unleashed a scale model of Han Solo’s freighter that’s made of over 10,000 Lego pieces. Unveiled for Singapore Legoland’s Star Wars Day event (on May 4), the ship measures at 110 cm by 85 cm (or, about 43 inches by 33 inches). That is massive for a Lego model; to put it in context, the Lego company’s official Ultimate Collector’s Series version of the ol’ rust bucket is made up of “only” 5,195 pieces and is 40 percent smaller than Titans Creations’ new toy. The official, limited edition Lego toy came out in 2007 and sold for $500 at the time, and sets are now being auctioned on eBay for around $5000 (and up). The level of detail is astonishing. Makes me wonder how long it took to put this thing together. Ah, the light saber. Weapon of choice for Jedi and Sith alike. 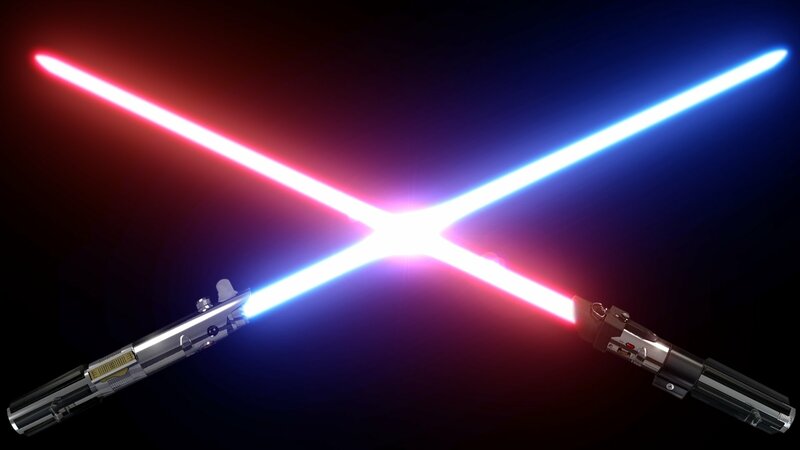 Given the success of the Star Wars franchise, I imagine many role-playing fans wish they could wield a real light saber. Nerd/geek Emory Harris created Uber Sabers (www.ultrasabers.com/ : the site has asked me to remove the direct link, so here is the address) to fulfill those dreams. Prices for the sabers run from $54.99 for standard sabers to $419 for custom sabers (complete with sound). The perfect gift for light saber loving Star Wars fans (wow, it sounds like I’m trying to sell a product here). I can’t post images, bc the site has a copyright on all of them, but if you’re interested, they have a lot of products available. This fan made trailer is one of personal dedication: To the original artists, whose expertise and craftsmanship through celluloid, inspired me as a kid to look towards the stars and to the possibilities that with great story telling, along with a touch of magic, the most mundane aspects of life could be transformed into the most fantastic. As early as 1964, Gene Roddenberry drafted a proposal for the science fiction series that would become Star Trek. Although he publicly marketed it as a Western in outer space—a so-called “Wagon Train to the Stars” (like the popular Western TV series)—he privately told friends that he was modeling it on Jonathan Swift‘s Gulliver’s Travels, intending each episode to act on two levels: as a suspenseful adventure story and as a morality tale. Roddenberry intended the show to have a progressive political agenda reflective of the emerging counter-culture of the youth movement, though he was not fully forthcoming to the networks about this. He wanted Star Trek to show humanity what it might develop into, if only it would learn from the lessons of the past, most specifically by ending violence. An extreme example is the alien species, the Vulcans, who had a violent past but learned to control their emotions. Roddenberry also gave Star Trek an anti-war message and depicted the United Federation of Planets as an ideal, optimistic version of the United Nations. His efforts were opposed by the network because of concerns over marketability, e.g., they opposed Roddenberry’s insistence that the Enterprise have a racially diverse crew. As a card-carrying Social Justice Warrior, learning all of the above led me to developing a deep appreciation for the fictional universe Roddenberry created. That doesn’t change my opinion that the Star Wars characters would lay the smack down on the Star Trek ones in a fight. Move over Mystery Machine! A new pop culture inspired vehicle is taking the world by storm. Ok, so that’s a bit hyperbolic. Still this R2D2 VW bus by Instructables user mimaki cg60 is pretty cool. Check out the link for more images as well as a description of the creative process. Paper Dandy AKA Marc Hagan-Guirey, is a contemporary artist practising the highly specialised art of Kirigami. He burst onto the art scene in 2012 with his critically acclaimed exhibition ‘Horrorgami’. ‘CUT SCENE: 12 Kirigami Models Inspired by Scenes from Star Wars cut from a Single Sheet of Paper’. As a life long fan of the Star Wars saga, it’s Marc’s ambition to continue working in the realm of film culture. He aims to create a body of work inspired by scenes from their legendary narratives via his craft of kirigami. Like his previous exhibition ‘Horrorgami’ the work will be presented within light boxes. Marc is not affiliated with Lucas Film or Disney or doesn’t hold a license to sell official merchandise, therefore he will not be selling editions of the art. This means the funds must come from elsewhere. His goal isn’t to make a profit – it’s simply to produce the exhibition so that Star Wars fans can enjoy seeing the unique kirigami models in their physical form. Every penny will go towards making a better gallery experience. Here’s a look at some of his art. Warning: It. Is. Amazing. Remember, all of these images were created with a single sheet of paper. Standing at 6’2″ and weighing 210 lbs., this fighter is engaged in a war on crime. With his genius-level intellect, incredible wealth, and world-renowned fighting skills, this man needs little introduction. Ladies and gentlemen, I give you Batman! His opponent is another man of tremendous power and resources. His name is synonymous with terror and death. Despite bearing the mantle of “Chosen One”, this man brought a once-proud intergalactic organization of so-called peacekeepers to the brink of destruction. Armed with a lightsaber and the ability to manipulate the Force, I give you Darth Vader! Done watching? Cool. Maybe someone can answer some questions for me. I’ll preface the following by saying I enjoyed the battle between the two (though I’m a bit weary of Bat-god). 1- how did the Batplane reach the Death Star? Even assuming the presence of the Death Star in our solar system, I wasn’t aware the Batplane could reach escape velocity. I suppose it could have launched from the Watchtower (whether its based in orbit around Earth or on the Moon), but even then a trip to the Death Star would surely take some bit of time. The technology in the Star Wars universe appears (to me) quite a bit more advanced than the technology Batman has access to. How the heck is the Batplane’s cloaking field sufficiently advanced to be able to render it undetectable to the sensors aboard the Death Star? How did Batman gain entry to the Death Star? Batman is remarkably proficient in the use of a lightsaber. I know, I know. That’s not a question. Sue me.